"This recipe was passed down from a friend, and now it is one of our favorites! It's great to make whenever there is left over chicken or turkey around! 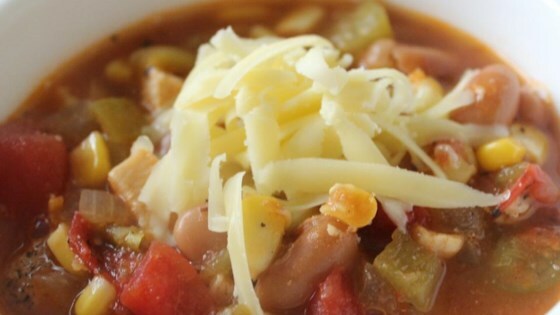 We pray for colder weather in California just so we can make this soup! You can substitute additional diced tomatoes for the tomatillos. If you would like the soup to be spicier, you can add some red chili flakes or salsa. Serve with these toppings for people to choose from: limes, cilantro, cheese, avocado, sour cream, and tortilla chips." Heat oil, and cook onion and garlic until soft. Stir in broth, tomatillos, tomatoes, chilies, and spices. Bring to a boil, then simmer for 10 minutes. Add corn, chicken, and beans; simmer 5 minutes. Season with salt and pepper to taste. I won the office chili cookoff with this recipe. Used fresh everything - includnig the tomatillo, tomatoes and chiles. Also threw in one small habanero. The dish is colorful and wonderful!